This event was originally scheduled for November 16. Changed due to potential bad weather. 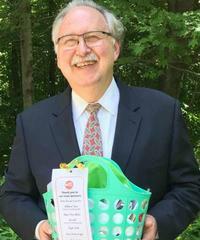 We are thrilled to honor retiring State Representative Steve Kulik at our next breakfast and hope you will join us in thanking him for his years of service to the region. Breakfast will be held at Cohn Family Dining Commons at Greenfield Community College, One College Drive in Greenfield. Please make reservations by Monday, November 26. FCCC members $15 (if prepaid or pay-at-door), $16 (billed). General admission $20. When making reservations, please let us know if you have food allergies so that we may accommodate your needs. 413-773-5463 or email. When making reservations, please let us know if you have food allergies so that we may accommodate your needs. Friday, November 30 begins at 7:30 a.m. Please make reservations by November 26. FCCC members $15 (if prepaid or pay-at-door), $16 (billed). General admission $20. When making reservations, please let us know if you have food allergies so that we may accommodate your needs.